Want to Improve Your Quickbooks Bookkeeping? Here Are 5 Tips! Do you own and operate your own business? Are you searching for a way to streamline your QuickBooks process? 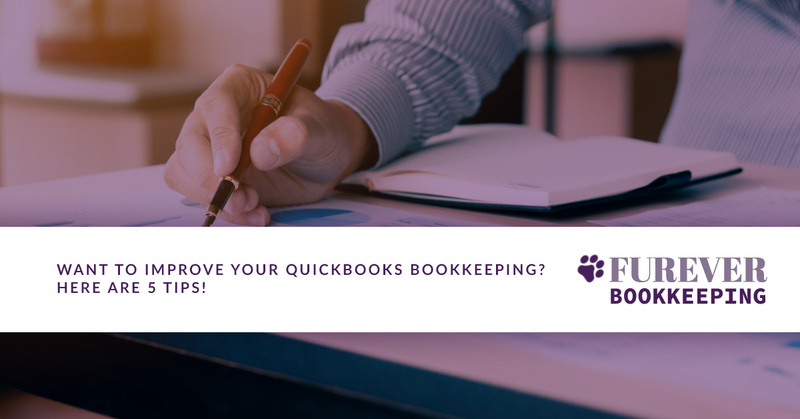 In this article, Furever Bookkeeping in Virginia — serving Tysons Corner, Alexandria, and Springfield — will share five ways to improve your QuickBooks bookkeeping process. Reconciling your accounts as they come in is a huge step in the right direction. However, just because you get your accounts reconciled doesn’t mean you’re finished just yet. You need to understand how to handle and code transactions to take care of your books — and it takes time to learn. Many businesses get hung up on transactions that they do not know how to handle. If this sounds like you, utilize the My Accountant feature and reconcile your books! You don’t want to ignore certain transactions. Not reconciling doesn’t give you an accurate view of your books. With numerous transactions per day, you may start to develop a book that looks confusing. Keep things simple and organize your book into something meaningful. Determine what your main metrics are for the business (one being cash flow), and organize the chart to show you those metrics at a glance. When your books are complicated, it will confuse you. Confusion causes mistakes. Mistakes cost you money. Develop a system that shows you bi-monthly or weekly financial reports that you can monitor at a glance. You will have your monthly and quarterly reports, but those are too broad to give you accurate information on your cash flow. Business decisions need to be made based on the most accurate information possible. One of the most common mistakes after not reconciling books is in accounts receivable and accounts payable. Business owners let A/R and A/P get away from them, and it causes a lag in financial information via their reports, which leads to decisions being made off the back of inaccurate information. Review your books frequently so that you can catch errors and take care of them. When it comes to QuickBooks, you can do it yourself, but it takes time and can cost you more over time. A great way to make sure your books remain accurate and available to you in reports whenever you want them is to outsource your bookkeeping needs. Furever bookkeeping serves Virginia business owners in Tysons Corner, Alexandria, and Springfield. Contact us today to get started on your books.